Search for Sister Dora in CBW. Find Sister Dora on the Pop Chart. DOROTHY WYNDLOW PATTISON was born at Hauxwell, near Richmond, Yorkshire, England, on January 16th, 1832, the eleventh of twelve children (the tenth daughter) of the Rev. Mark James Pattison (1788-1865) and Jane Winn (1793-1860), daughter of a banker and former mayor of Richmond. Rev. Pattison was strictly evangelical and mentally unstable; his wife was induced to commit him to an asylum for almost a year in 1834-1835. The eldest son, Mark Pattison (1813-1884), became an Oxford don and for a time joined the high-church Oxford Movement. The father tried to cut off all communication between the nine sisters at home and this supposed Papist infection, though Mark fostered Dorothy's education and she was often his companion on holidays and visits. The tension between father and son set the stage for Dorothy's non-dogmatic religious fervor, but in her career she broke away from both father and brother. Many biographies depict a happy childhood for the somewhat frail but beautiful child whom her father's called his "Little Sunshine." Dorothy is said to have "inherited from her father, who was of a Devonshire family, that finely proportioned and graceful figure... and from her mother...those lovely features which drew forth the admiration of everyone who had the pleasure of knowing her" (M + S, 241). The sisters were occupied in caring for their ailing mother, works of charity among the villagers, and outdoor exercise, including Dorothy's great pleasure, riding to hounds. Yet the father gave formal education to his two sons only, resisted all suitors and disowned the daughters who married, and tried in every way to contain his daughters and wife within the home and according to his will. Biographies of Dorothy emphasize her innate strong will, source of the greatness as well as the difficulties of her life. Although Dorothy wished to join Florence Nightingale as a nurse during the Crimean War (1853-1856), her father forbade her to leave home, pointing out that without training, she would be "worse than useless" on the front. Most biographies omit what the ODNB matter-of-factly understates: "Tall and pretty, Dorothy Pattison was in love with several men during her life, both before and after she took religious vows." An engagement to a handsome farmer and soon another to a respectable clergymen both came to nothing, under the disapproval of her family and her own reluctance to give up her vocation for anything less than passion. After Dorothy's mother died in 1861, Dorothy won the great point of independence, serving as village schoolmistress at Little Woolston, Buckinghamshire, for three years. There, "She had to live alone in a cottage, and do everything for her self; but the people never for a moment doubted she was a real lady, and always treated her with great respect" (M + S 242). One of her frequent illnesses led her to take a holiday to recuperate at Coatham, near Middlesborough, where she visited an Anglican sisterhood and observed their work in a convalescent home. In September 1864 she joined the Christ Church sisterhood, adopting the name Sister Dora. Most accounts stress her humiliation under the housework and impersonal discipline, though she has already prided herself on being able to cook. Many accounts tell of her bursting into tears "when the beds which she had just put in order were all pulled to pieces by some superior authority, who did not approve of the method in which they were made" (M + S 242). The sisterhood trained and then dispatched nurses to small hospitals and private patients, and for some years Sister Dora's assignments frequently changed. In January 1865 she was sent to Walsall, a manufacturing district near Birmingham, where a small cottage hospital had been formed in 1863 for emergency treatment of industrial injuries from the coal mines, iron pits, tanneries, and railways. Her decision to join the sisterhood meant a breach with her family, who considered the work demeaning; Mark disapproved of her "romance" with self-sacrifice. Many biographies repeat the idea that the sisterhood prevented her from attending her father's deathbed and funeral (1865), and that this led to her decision to leave the sisterhood. More recent accounts make it clear that the breach with the sisterhood came later, when she made her own decisions about her nursing assignments, and that bad relations with her family as well as mistimed messages led to her not going home at that time. The first appearance of volunteer nurses, resembling Catholic nuns, caused some distrust. and there are anecdotes about local people believing that secret rituals were performed in a closed-off room in the hospital. In one anecdote, a boy threw a stone that hit Sister Dora on the forehead, calling her a "Sister of Misery." But soon professional men and workers all were won over by Sister Dora's beauty, humor, graceful manners, and dedicated hard work. By 1867, when a new hospital had to be built, Sister Dora was put in charge, and clearly demonstrated her administrative skills as well as her increasing expertise in treating wounds and illnesses. Religion infused everything she did, from prayers and songs to the stories she told and letters she wrote explaining her vocation, but evidently it was a non-sectarian, populist form of belief that attracted her patients and helped them to recover. She often said when a patient's bell would wake her in the night, "The Master is come, and calleth for thee!" She once wrote to a friend, who was engaging a servant for the hospital, "this is not an ordinary house, or even a hospital...all who serve here...ought to have one rule, love for God, and then, I need not say, love for their work." All biographies of Sister Dora assemble the picture of an admirable personality, some pushing the limits of credibility toward the heights of sainthood. At the same time, almost all note the flaw that she herself acknowledged, self-will. But without her driving sense of purpose and resistance to obstacles, "it is doubtful whether she could have achieved all she did," as Mabie and Stephen put it (following Lonsdale and Baring-Gould). Women who came to Walsall to study nursing with her (she often had "lady-pupils") objected that she would not let anyone help her and did not delegate well, even that she had little appreciation of women. From a later perspective, Sister Dora seems to have gained power through a version of self-denial not dissimilar to an eating disorder or suicidal tendencies; the famous risks she took with infections make more sense as ways to court death when her own desires were defeated. As noted, the biographies downplay Sister Dora's series of attachments to suitors; most seem unaware of any such possibilities of marriage, though some note that she was severely tested by her love for a medical man, possibly Redfern Davies, whom she met in Walsall, her equal in many qualities but an unbeliever. After a struggle, she decided to continue her vocation and sustain her dedication to Jesus. Only since the 1930s have letters reappeared that reveal that Sister Dora had a relationship in 1876 with a younger man, an industrialist, Kenyon Jones. Jo Manton considers Sister Dora "the prisoner of her own legend" (306); she had to keep their love a secret. The legend drew upon the beauty, purity, and gentility of a lady, but her vocation permitted considerable bodily intimacy and participation in graphic scenes and physical tasks unusual for the type. Sister Dora worked with little pause throughout the day and night, visiting all beds, supervising all meals, often skipping her own food or rest. She was seldom seen sitting down. This work was enlivened with a sense of performance and playfulness, singing and telling tales that entertained her patients, whom she gave nicknames and special notice or favors. Yet the work was repeatedly interrupted by serious illness; she seemed careless about infection, coming in contact with all kinds of disease and exposed to all weathers. Other than her illnesses, her years of service in Walsall are shaped by memorable catastrophes for the workers in the town, events featured in the vividly realist bas-reliefs surrounding the base of the statue that Walsall erected after her death. One was colliery disaster in 1872, and another was an explosion in 1875 of a furnace at Birchett's Iron Works which covered eleven men in molten metal. For ten days without resting Sister Dora bravely tended to the victims in a special ward that pupil-nurses and doctors were loath to enter, faced with the stench, the cries, and the sight of charred bodies. Only two men survived. Yet another heroic episode came with a renewed epidemic of small-pox; to convince the people to go to a quarantine hospital, Sister Dora volunteered to place herself in isolation there. She showed no concern for her own risk, but it meant many months of hard labor because there were only a few unreliable servants. Contemporary newspapers before and after her death began to record the remarkable deeds of this self-sacrificing servant of the suffering poor. 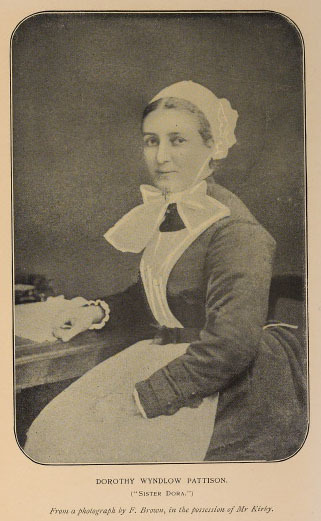 Her medical colleagues attested to her skill in various branches of care, from surgery to the dressing of wounds to the treatment of eye injuries; late in life she studied the work of Lister on antiseptic treatment in London, but she had chosen not to pursue further medical training in favor of her particular hands-on mission among the workers. This mission included rounding up prostitutes and clearing out the pubs for midnight prayer meetings in the town. Many locals recalled her with reverence as a kind of saint, and some believed she could work miracles. Gifts and testimonials included a pony and cart given to her by railway men; she used it to make house calls, and to take convalescents on jaunts. She particularly liked to use her own funds to sponsor feasts for patients and holidays for the poor children who were recovering from illness or injury. She hid the records of the extent of her charities. After a brief holiday, she returned to Walsall in her final illness, and died on 24 December, 1878. Her last wish, they say, was to die alone. And some said, and had to be convinced otherwise, that she converted to Catholicism on her deathbed. Her funeral on the 28th of December was a town spectacle, a procession of thousands. In 1886, a statue by Francis Williamson was erected in another public ceremony, following upon a stained-glass window in St. Matthew's Church (1882-1883). Sister Dora's reputation as a modern saint was international for some decades. She appeared in as many as twenty collective biographies besides numerous biographical reference works and countless essays and articles. And even Susan McGann's 2004 biography in ODNB ends with this same quotation from Matthew 25:40. Based on ODNB, Mabie and Stephens (M+S), an adaptation of Baring-Gould, drawn from Margaret Lonsdale's full-length biography of 1880. John Westmacott, "Sister Dora of Walsall." John Westmacott's concise biographical article about Sister Dora. A note indicates that the article is printed by permission of 'Our Inheritance Ministries', Polegate, East Sussex. Text linked through the website of the Ebenezer Baptist Church in England. Margaret Lonsdale, Sister Dora: A Biography. 6th ed. Boston: Roberts Brothers, 1880. Margaret Lonsdale's seminal biography about the life and work of Sister Dora. The first ("Copyright") edition, vol. 1911 in Collection of British Authors, Leipzig: Tauchnitz, 1880 (with "The right of translation is reserved," this was a standard imprint to establish copyright), has the epigraph from Spenser and the frontispiece portrait of Sister Dora that is adapted in many illustrations; it is essentially the photograph credited to Mrs. Williams, Wolverhampton, in our "carousel" above. Unlike later editions, the first edition presents this frontispiece above a printed script "signature" of the subject and at the bottom of the page an illegible (apparently holograph) identification of the image. Lonsdale in the preface (in later editions, "Preface to the First Edition") faults this portrait: "Mr. Jeens was seriously ill when he undertook it," so it lacks the "spirit" of the living original and the photograph (Little, Brown, 1880: iii-iv). This preface also explains that Lonsdale has preferred to avoid the "many stories...possessing an element of the marvellous, nay, of the supernatural, which would have made her biography sensational, as well as more interesting....I never heard one of these stories from her own lips"; they arose from "the veneration...by the ignorant and the superstitious, as well as by the credulous among the educated" (iv-v). "Preface to the Fourth Edition," dated January 31, 1880, notes deletions of letters (included in second and third editions) concerning Sister Dora's deathbed conversion: she in fact "never became a member of the Roman Catholic Church" (268). Lonsdale has also removed mention of autopsy (vii-viii). She alludes to an outcry against her in Walsall, and insists that Sister Dora wanted her own life to be written; in final "justification," Lonsdale adds that this life is "public property," not the exclusive treasure of Walsall (viii-ix). With these alterations, the American editions are "From the Sixth English Edition," and those in 1880-1881 through 1914 (32nd ed.) appear to use identical plates, though pagination varies depending on whether it begins with front matter or chapter one. London: Kegan Paul, 1881 omits the preface to the fourth edition. Links through Google Books and Internet Archive. Susan McGann, "Pattison, Dorothy Wyndlow [Sister Dora] (1832–1878)." Oxford Dictionary of National Biography. Ed. H. C. G. Matthew and Brian Harrison. Oxford: OUP, 2004. Oxford Dictionary of National Biography entry on Sister Dora written by Susan McGann. This comprehensive biographical record includes a list of other sources and archive materials related to Sister Dora.